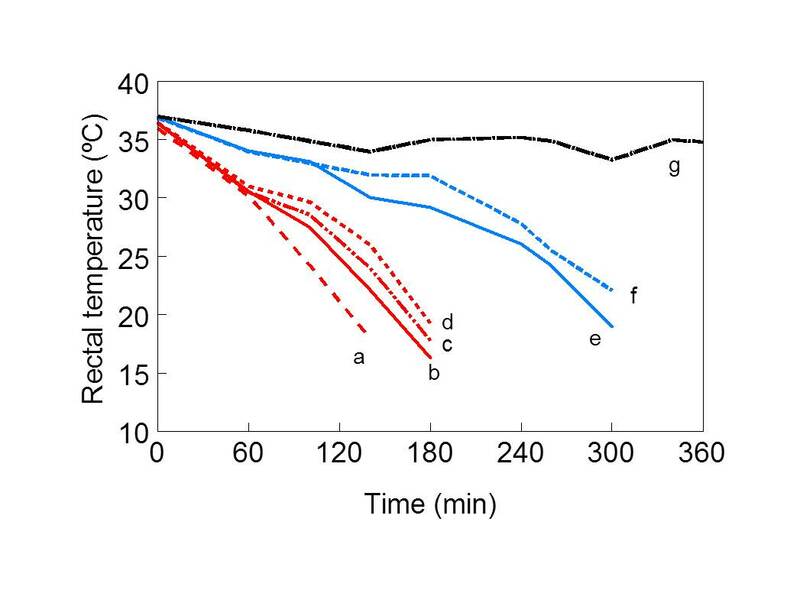 Individual chicks may have different environmental temperature demands. The trick is to provide every chick with the right body temperature. By measuring individual chick temperatures, hatchery staff and broiler growers or layer producers are better able to provide the right environmental temperature for every flock at all times. This will reduce first week mortality and improve performance. When a chick hatches, it is still more or less cold-blooded and cannot regulate its body temperature properly. To maintain body temperature at the desired level, the young chick depends mainly on its environment. After hatching, the chick gradually transforms into a warmblooded organism that can regulate its body temperature within certain limits by increasing or decreasing heat production or food intake. On average, this transition period lasts about 3-4 days and the duration depends mainly on the size of the chicken and the age of the breeder flock. Small chicks appear to have more problems controlling their temperature because of their relative large surface area compared to body mass. For chicks from a young breeder flock, (till 35 weeks) the transition to a fully developed heat regulating system lasts about 24 to 48 hours longer compared to chicks from an older flock. This process is not clearly understood, but we must realise that chickens from different sources may have different temperature requirements. Body temperature of the young chick is the result of the balance between the amount of heat produced by the chick and the amount of heat lost to the environment. Although day-old chicks have very limited possibilities to regulate heat production, they are able to influence their heat loss. When body temperatures become too high, they will start gasping for air in order to cool down by the evaporation of water. At low body temperatures, chicks huddle against each other to minimise their total surface in order to prevent excessive heat loss. If body temperatures are outside their tolerance limits, day-old chicks will express their inconvenience by screaming and by moving around. In the field, it appears that chicks from young breeder flocks do not express their discomfort as clearly as chicks from older breeder flocks; something the farmer should be aware off. Four decades ago, Dr Kaltofen at the Centre for Applied Poultry Science “Het Spelderholt” in the Netherlands, investigated the effect of temperature and humidity on day old chicks. Based on the behaviour of the chicks in varying conditions, he defined a comfort zone, both for solitary chicks and for chicks placed with 50 in a box. At varying environmental conditions, the rectal temperature of the chicks was measured. Temperature ranged from 30°C to 44°C; relative humidity ranged from 20% to 90%. Measurements were performed in still air, however, and we have to be aware of the chilling effect of air velocity on body temperature, as the heat transfer will be much higher at higher air velocity. Individual, solitary chicks did not show any abnormal behaviour at environmental temperatures of 32 – 34°C (Table 1). These chicks were able to maintain rectal temperatures at 39ºC. For comparison: a mature, non-brooding hen has a deep body temperature of 41°C, a brooding hen approximately 39°C. 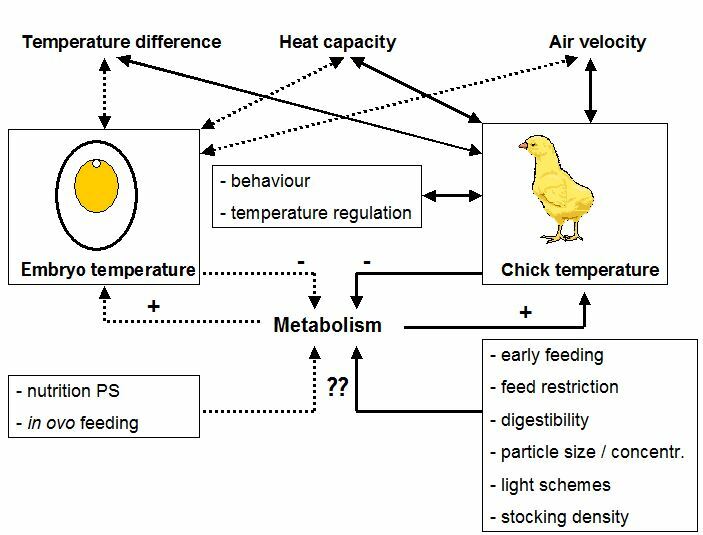 Not all chickens responded identically at lower temperatures, as shown in Figure 1. In this experiment, day-old chicks were placed at 10°C and 60% relative humidity. Only one (line g) out of 7 chicks was able to maintain rectal temperature above 35°C. Apparently, the temperature control mechanism of the other chickens was not developed sufficiently at this time. Other chicks showed more difficulties maintaining body temperature (e-f) while most chicks (a-d) cooled down below 20°C within 3 hours. To maintain body temperature between 39 and 39.5°C, environmental temperature should be kept between 30.5 and 36°C for solitary chicks, and between 28 and 30°C for chicks in boxes. When temperature inside the box decreased, chicks huddled together. Doing so, they reduced their total surface area and minimised heat loss. Apparently groups of chicks can deal with a larger environmental temperature range than individual chicks. 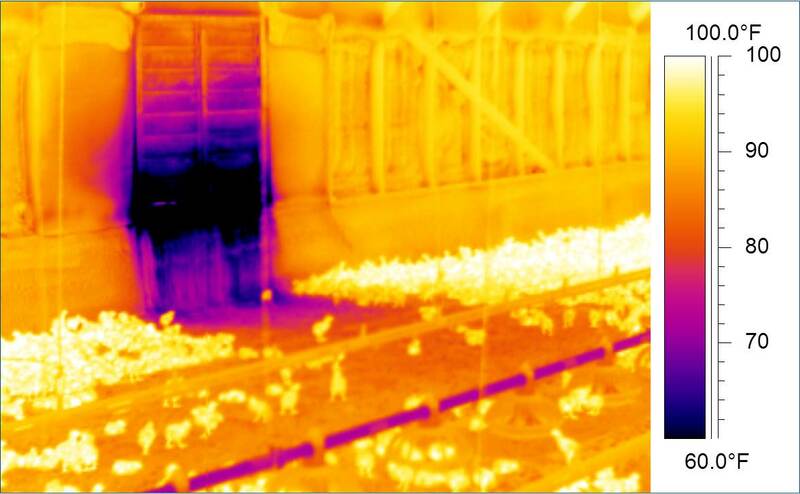 Table 1 shows that at body temperature below 39°C, chicks respond by huddling together. At high temperatures, chicks increase their heat loss through panting, as panting evaporates water and that process consumes energy that cools down the chick. Humidity, however, hardly influenced the behaviour of day old chicks. High relative humidity decreased the effectiveness of panting. At relative humidity higher than 85% the temperature comfort zone decreased by 1°C. At relative humidity lower than 40% the temperature comfort zone increased by 1°C. At relative humidity below 40%, typical draught reactions occurred: swallowing, eye blinking, closed eyes, drowsy attitude. At high relative humidity no typical “wet” reactions occurred. High humidity helps to evenly distribute the heat through the chicken house and diminishes hot and cold spots. In the hatchery and during transportation, cold stress must be avoided. Cold stress can be induced when hatches are pulled too early, when processing room temperatures are too low, when air velocity is too high or when moisturisers are pointed directly towards the chickens. In temperature controlled trucks, cooling capacity and ventilation rate are set for the number of chicks loaded. Chickens in a half-loaded truck can easily become too cold if cooling capacity or ventilation rate is set for a fully loaded truck. When receiving day-old chicks, the temperature at bird or floor level must be correct. At that time, body temperature is the most critical factor for bird performance. Until the correct body temperature is reached, the young birds do not eat or grow satisfactorily, and are more susceptible to disease. Brooding temperatures for chicks from a young breeder flock should be set higher and maintained for a longer period. This allows all birds to develop their temperature regulatory function, as this is a function of time and not uniform for all birds. At placement some birds will be more developed than other birds due to natural variation, incubation conditions, hatchery processing or transport conditions. Body temperature variation of chicks at placement is a good parameter for proper chick management, including the process of incubation. Body temperature can be easily measured with an infrared ear thermometer at the navel (blow away the down) of young chicks. Ideally, all birds should have body temperatures between 39.5 and 40.5°C, regardless of housing system, breeder age, transportation conditions, time, etc. Chicks from different backgrounds have different temperature requirements. It can be very helpful to measure chick temperatures and to adjust environmental temperatures to provide all chicks the right naval temperature of between 39.0 and 40.5°C. Even better would be to measure cloaca temperature with a small rectal thermometer. This reduces the variation in temperature, and temperatures between 40.0 and 40.5ºC are optimal. Not only for the first day, it also works when birds grow older. This will minimise the risk of wrong starting temperatures in the first week. This tool can help the broiler or pullet farmer as well as the poultry integrator to optimise their technical and financial results.